[182 Pages Report] The aseptic packaging market size will grow from USD 39.62 billion in 2017 to USD 66.45 billion by 2022, at an estimated CAGR of 10.89. The base year considered for the study is 2016 with the market size projected from 2017 to 2022. The primary objective of the study is to define, segment, and project the aseptic packaging market size on the basis of type, material, application, and region. The study also aims at strategically analyzing micromarkets with respect to individual growth trends, future prospects, and their contribution to the total market. It also provides detailed information about the main factors influencing the growth of the market (drivers, restraints, opportunities, and industry-specific challenges). In addition to this, the study analyzes competitive developments such as acquisitions, new product launches, expansions & investments, and research & development activities in the aseptic packaging market. The growth in the demand for healthy convenience products in the developing economies of Asia-Pacific and Latin America has pushed manufacturers to expand their distribution network to these areas. Consumers are also demanding a wider range of products in different sizes and flavors. Some of the developing countries do not have access to large and technically advanced cooling systems required for the distribution of certain products that need to be kept in cool environments. Food products, fruits, and vegetables are now being transported using bulk aseptic food processing and packaging across the world. This ensures that the quality and nutrition derived from the product is preserved and also minimizes the storage, transport, and packaging deficits that used to affect the product. The recent trends reflect that convenience packaging does not only preserve and protect the product, but also that the product can be quickly made into meals without compromising on quality. Aseptic packaging helps maintain the freshness of the product and can be made available in zipped pouches and microwavable kits, which are convenient to the consumer. This is further driving the preference for aseptic packaging. To strategically analyze micromarkets1 with respect to individual growth trends, future prospects, and their contribution to the total market. To strategically profile key players and comprehensively analyze their market shares and core competencies. To track and analyze competitive developments, such as agreements & joint ventures, mergers & acquisitions, and new product developments in the aseptic packaging market. The research methodology used to estimate and forecast the market size included the top-down approach. The total market size for aseptic packaging was calculated, and accordingly, the percentage was allotted to different sectors in each of the segments, which were done on the basis of extensive primary interviews and secondary research such as Aseptic And Antimicrobial Processing and Packaging Association (AAPPA) and Flexible Packaging Consultants. Primary research involved in this report includes extensive interviews with key people such as CEOs, VPs, directors, and executives. After arriving at the overall market size, the total market was split into several segments and subsegments. The data triangulation and market breakdown procedures were employed to complete the overall market engineering process and arrive at the exact statistics for all segments and subsegments. The breakdown of profiles of primary respondents is depicted in the figure below. The market ecosystem involves various stakeholders in the aseptic packaging market. It starts with the raw material suppliers such as Tetra Laval International S.A. (Switzerland), Amcor Limited (Australia), Bemis Company, Inc. (U.S.), Robert Bosch GmbH (Germany), Sealed Air Corporation (U.S.), and Greatview Aseptic Packaging Co. Ltd. (China) that are the manufacturing companies of the aseptic packaging. The next level in the chain involves the assembly team that is monitored by the manufacturers such as Tetra Laval International S.A. (Switzerland), Industria Machine Automatiche S.P.A (Italy), SIG Combibloc Group AG (Switzerland), and Reynolds Group Holdings (New Zealand). It is followed by the marketing and sales of the finished products, which is only possible if an efficient distribution channel is developed. Finally, the end products are distributed to the consumers. In December 2016, Amcor (Australia) launched PET bottles to be used to deliver dairy, aseptic, and high-pressure processed (HPP) liquid beverages. These products were to be used for cold-fill for dairy and juice, aseptic for dairy and juice, and high-pressure processing (HPP) for juice. In December 2015, Bemis Company, Inc. (US) acquired Emplal Participações S.A. (Brazil), a manufacturer of rigid plastics for food and consumption applications. The acquisition enhanced the company’s position in South America and strengthened its product portfolio. This research report categorizes the aseptic packaging market based type, material, printing technology, application, and region. 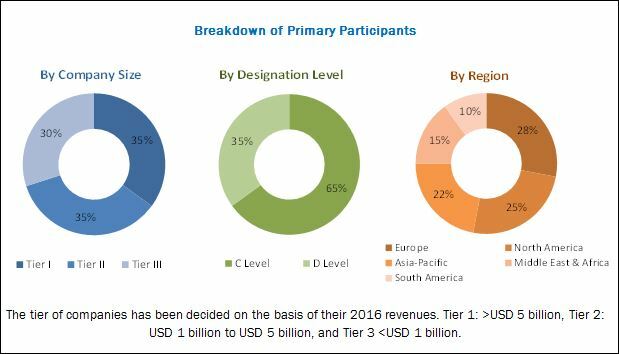 MarketsandMarkets projects that the aseptic packaging market size will grow from USD 39.62 billion in 2017 to USD 66.45 billion by 2022, at an estimated CAGR of 10.89%. 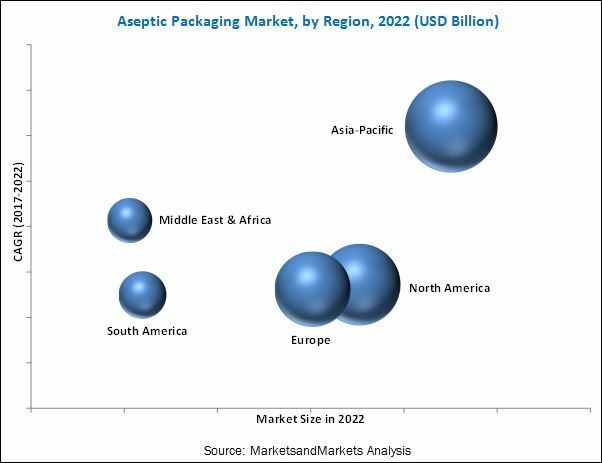 The aseptic packaging market is expected to witness a high growth due to factors such as an increase in urban population, growth in demand from the food and beverage sectors, and preference for convenient packaging. This report has been segmented on the basis of type, material, application, and region. On the basis of material, the paper & paperboard segment is projected to be the fastest-growing market during the forecast period. On the basis of type, the cartons segment accounted for the largest share in 2016, while the beverage segment dominated the applications of aseptic packaging in 2016. In terms of value, the cartons segment accounted for the largest market share in 2016 and is projected to grow at the second-highest CAGR during the forecast period. This growth can be attributed to the increasing demand from the milk & dairy packaging industry. Cartons offer many features such as easy stacking of products, variety in shapes and sizes, and strong shelf presence. They also provide excellent barrier properties to the product enclosed within. In terms of value, the paper & paperboard segment, by material, accounted for the largest market share and is projected to grow at the second-highest CAGR during the forecast period. The market for paper & paperboard in aseptic packaging is driven by the increasing demand for cartons in aseptic packaging. Under the application, the beverage sector is projected to grow at the highest rate due to the rising demand for milk and dairy products packaging as it offers product protection and extends the shelf life of the product. Aseptic packaging for food & beverage products reduces the usage of preservatives. In 2016, the Asia-Pacific region accounted for the largest share in the total market for aseptic packaging, in terms of value, followed by North America and Europe, owing to manufacturers’ focus on developing low-cost aseptic packaging options. The Asia-Pacific region is projected to register the highest growth during the forecast period; this is attributed to the large customer base for FMCG products and consumer durables, due to the growth in population in countries of this region; this, in turn, is expected to lead to the growth of the aseptic packaging market. The aseptic packaging market in the North American region is developed and matured; the market in the U.S. is projected to grow the highest rate from 2017 to 2022. High initial capital investments has caused an unfavorable impact on the profitability of the packaging industry. The global aseptic packaging market is dominated by players such as Tetra Laval International S.A., Robert Bosch GmbH, Amcor Limited, Bemis Company, Inc., E.I. du Pont de Nemours and Company, Reynolds Group Holding Limited, DS Smith, Becton, Dickinson and Company, Industria Machine Automatiche S.P.A, SIG Combibloc Group AG, Printpack Inc., Sealed Air Corporation, IPI srl, Agropour Cooperative., Scholle Ipn, Shanghai Skylong Packaging Machinery Co., Ltd., Schott AG, Goglio S.p.A, Lamican International AY, ELOPAK Group, Ecolean AB, Krones AG, and MoloPak LLC, and Jpak Group Incorporated.. These players adopted various strategies such as mergers & acquisitions, new product launches, expansions & investments, and agreements & joint ventures to cater to the needs of the aseptic packaging market. What is the political, social, economic, and technological scenario currently prevailing in different regions and their impact on the demand for aseptic packaging? What are the major trends evident in the global aseptic packaging market? 12.4.2 Tetra Laval International S.A.
12.4.4 Greatview Aseptic Packaging Co. Ltd.
13.5 Tetra Laval International S.A.
13.7 Greatview Aseptic Packaging Co., Ltd.
13.24 Shanghai Skylong Packaging Machinery Co., Ltd.